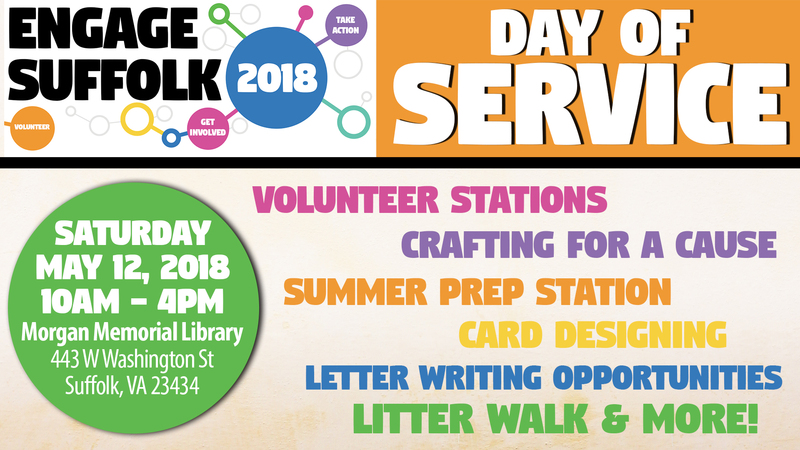 Invest in your community with a day of service at the library.There will be volunteer stations including crafting for a cause, letter writing opportunities, and dog toy making for children, teens, and adults to come lend a hand. There will also be a litter walk to pick up garbage and debris departing from the library at 11 am. From 2 pm to 4 pm, we will be at the Friends of the Suffolk Public Library bookstore (300 Carolina Road) helping organize books for their next sale. Teens can use this opportunity to earn community service hours. Invite your friends to attend through the Facebook event page. Litter grabbers, safety vests, gloves, and bags will be provided for the litter walk, but please bring suitable clothing and footwear.Learn more about our Engage Suffolk yearlong initiative. SPL events are free to attend and open to people of all abilities. If you or someone in your party will require accommodations in order to participate, please call 757-514-7323 and ask to speak with a manager. You do not need to be a library member in order to attend.